This was actually a slide that I scanned and was taken in December 1947 by my late Aunt who loved photography and always kept a camera handy. 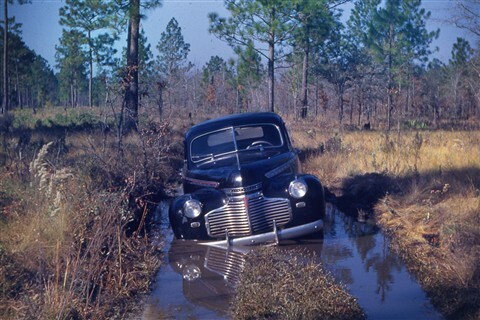 Location was in south Georgia just outside the little community of Bannockburn and it was not uncommon for vehicles to get stuck after heavy rains in those days. The car belonged to another Aunt who misjudged the depth of the water. Notes: I have no idea what kind of camera was used for this slide.